CEO views on social issues are being heard like never before. The internet, social media, and Twitter in particular give CEOs with global brands a voice that can reach across the world. Some say CEO activism is new, some say it is too dangerous, and some say there is no analytical foundation for engaging in such activity. We beg to differ on all three counts. The first myth about CEO activism is “it’s a new phenomenon.” Actually, news organizations have reported on large, religion and faith-based companies for decades. The leading sentence of one such article complains about a general lack of public awareness: “Some major American companies are extremely religious — and most people don’t notice.” A list of large American companies that publicly embrace religious or faith traditions are provided in the sidebar table. Corporate spending on politics is another form of corporate activism. Lobbying in 2017 is estimated to be about $3.4 billion, and corporations and their executive officers are credited with contributing the majority of the $6.5 billion spent during the 2016 presidential and congressional elections. Our assertion here is two-fold. First, when CEOs or their companies take public stands on topics such as religion or the environment, or fund lobbyists or political campaigns, they are engaged in a political act. Second, complaining that CEOs are getting too political is also a political act. Some assert that public expression of religious beliefs is not political. This is obfuscation. Religion is the underlying motivation and public justification for many recent US policy initiatives, from Planned Parenthood defunding to the North Carolina transgender law. There is no escaping the fact that many US policy initiatives are anything but secular, which inescapably in turn makes public expression of support for a particular religious tradition a political act. Others assert that businesses and their leaders should not be political. This assertion is political for several reasons. First, it implies companies and their leaders should never invest in lobbyists or political campaigns, which would require new laws to enforce. Second, the assertion that some CEOs are too political is often rooted in a conservative complaint that too many CEOs are now taking liberal positions. CEO’s of large corporations have a more powerful voice thanks to the power of the internet and social media—especially Twitter. CEOs need not wait for an interview with the media; they can broadcast their position on Twitter. Individuals and other organizations pick up their statements and amplify them from there. More CEOs of large corporations are publicizing liberal views. In other words, when you add religious CEO activism to the equation, the accurate conclusion is that more CEOs are taking liberal, rather than conservative or religious, stands on political issues. The second myth about CEO activism is that it poses a serious threat to financial success. Salesforce CEO Marc Beinoff said board director Colin Powell (former secretary of state and a retired four-star general), cautioned him about CEO activism: “The farther you go up the tree, the more your backside is going to be exposed, and you’d better be careful.” But Salesforce stock has continued a remarkable grow trend throughout Benioff’s activism. Chick-fil-A is an oft-cited example of the dangers of CEO activism. The company’s CEO, Dan Cathy, spoke out against gay marriage in 2012 by saying: “We’re inviting God’s judgment on our nation when we shake our fist at him and say we know better than you as to what constitutes a marriage. And I pray God’s mercy on our generation that has such a prideful, arrogant attitude that thinks we have the audacity to redefine what marriage is all about.” A few days later he doubled-down and added: “Guilty as charged.” [I am very] supportive of the family—the biblical definition of the family unit.” Numerous store protests and boycotts immediately ensued. One might expect the ensuing outrage expressed against Chick-fil-A would have hurt their business. Instead, it grew 14% in 2012. A counter-protest to support Chick-fil-A was organized on Facebook and sponsored by conservative politician, news host and Christian minister Mike Huckabee (father of Sarah Huckabee Sanders). This certainly helped Chick-fil-A but in no way accounted for their 14% growth. The more likely explanation is that many of Chick-fil-A’s customers are conservative Christians, they resonated with Cathy’s message, and “voted with their feet” by increasing their store visits. The HBR study did identify two companies that experienced backfires: Papa John’s and Comcast. Papa John’s then-CEO John Schnatter blamed declining 2017 sales on NFL players who were kneeling during the national anthem to protest racism. Soon after, Schnatter stepped down, Papa Johns discontinued its NFL sponsorship and its stock price continued to decline in 2018. On the one hand, the Papa John’s fiasco could be evidence of the risk of being political. On the other, it more likely shows that markets and boards are strongly inclined to punish poor CEO performance. HBR also pointed to a stock decline for Comcast after their September 2017 effort to encourage employees to support immigrant “Dreamers” legislation. However, their fourth-quarter revenues rose 3.4% which was close to 4% for Disney. Now it appears that Comcast’s stock price drop is more a response to industry uncertainty introduced by the proposed and troubled merger of Time Warner and AT&T. Delta Airlines was punished by Georgia’s Republican legislators for discontinuing a National Rifle Association (NRA) discount. Delta’s action was announced 10 days after the February 14, 2018 high school shootings in Parkland, Florida. Two months later, Delta’s stock price is up over one percent. Perhaps the most instructive political activist gaffe involves Under Armour’s CEO Kevin Plank. In early February 2017 Plank offered enthusiastic support for President Trump “as a real asset” during a CNBC interview. NBA superstar Stephen Curry quickly retorted that Plank was right “if you take off the last two letters from the word “asset.” While Under Armour was already in trouble from weak new product sales, Plank’s comments further undermined the brand’s standing with younger athletes who are essential to sales growth and its fashion brand image. The third myth is that scant data exists on social issues. This belief is supported by the limited number of articles published on corporate activism that offer data-driven insights. Significant opportunity exists, however, in the vast store of free data offered by Google Trends. It allows companies to explore social issues in considerable detail. Researching political issues can be tricky, as infamously demonstrated by 2016 US presidential election polling. One of the most important lessons from those inaccurate predictions is that surveys can miss what is really going on. What people say (e.g., I will vote on Tuesday) and what they actually do (e.g., I actually voted on Tuesday) can be quite different. One of the most important studies of the “tell the truth” dilemma is provided by Seth Stephens-Davidowitz in his seminal book Everybody Lies. This is a must-read for anyone who studies political and social issues. His most trusted data source is Google Trends. His contention is that people don’t lie when they conduct searches on the internet because it is largely performed as a private, unobserved activity. So, Google Trends data can tell us much about what people truly think, especially on topics where people are less inclined to be totally honest and provide full disclosure. Consider the research done by Global Strategy Group(GSG). Their recent survey leads them to conclude that people only want companies to support social or political issues that relate to their specific business or mission. For example, they suggest that it is far more appropriate for companies to take a position on equal pay for women than marijuana legalization. But the GSG survey results may be biased by the underlying importance of a given social issue. As shown in the chart below, pay-related Google searches are far more common than race, marijuana and transgender searches. The implication here is subtle: the GSG survey responses may reflect the importance of the social issue more than its appropriateness for corporate activism. Returning to the Delta situation mentioned earlier, Professor Koen Pauwels examined online and offline sentiments toward Delta after their stand against the NRA was announced on February 24, 2018. He found the two sets of sentiments differed substantially. 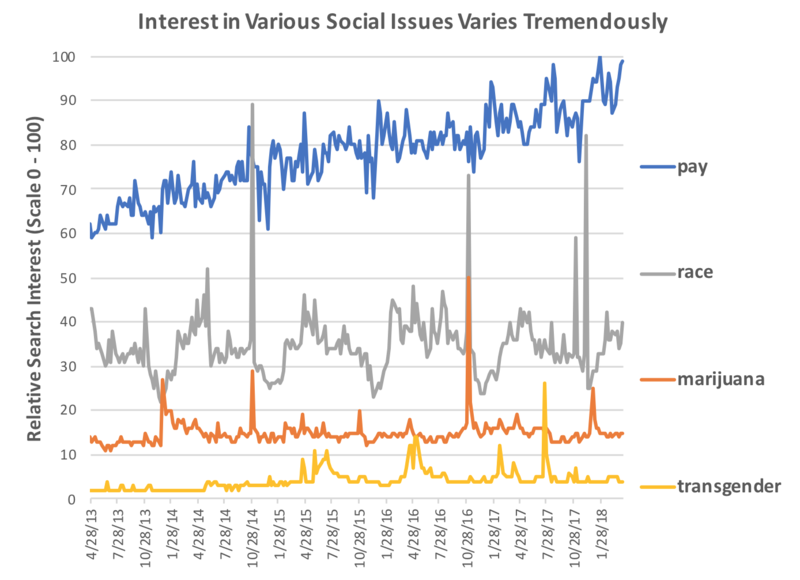 Online (e.g., social media like Twitter and Facebook) sentiments peaked soon after Delta’s announcement and most were attack-oriented and negative. Offline (e.g., word-of-mouth, one-on-one or small group conversations) sentiments, on the other hand, were positive and tended to express loyalty or a defense for Delta. It can be difficult to distinguish between a company’s social media brand image in the moment and the same company’s brand image over time with its active customer base. In the case of Delta, while a number of NRA supporters were quite upset with Delta’s action, their active customer base was inclined to be supportive. Going further, it is possible that the strong, negative social media outbursts and subsequent Georgia legislative reaction actually stimulated a stronger loyalty response among active Delta customers than if the NRA supporters and Georgia legislature had done nothing. Basic marketing principles tells us the characteristics of a good target market include the prospects for steady if not growing revenues. Let’s say the vertical axis for the previous chart tracked industry revenues rather than search interest. Then, if all other factors were held constant (e.g., number of competitors, barriers to entry, margins, etc. ), then the “pay” industry is far more attractive than the others simply due to its size and growth. Further, the unpredictable peak volumes associated with the “race” and “marijuana” industries would be challenging to manage. They would probably be accompanied by heavy carrying costs, occasional but intense distribution demands, stock-outs, and so on. And, a marketing campaign to impact race would depend on rapid mobilization around periodic spurts in demand. Marc Benioff’s stock appreciated 120% while campaigning for social issues. Let’s say he now wants an analysis of other potential social issues to pursue. Starting in 2015, Benioff tackled the challenge of pay inequality for women by spending $3 million to address unexplained pay differences. Then he fought against Indiana’s legislation permitting discrimination against gay and transgender people, which then-governor Mike Pence was forced to revise. Next, Benioff targeted North Carolina’s transgender legislation, and ultimately 100 chief executives signed a letter protesting the law. Benioff also helped push Georgia’s governor into vetoing a bill that would allow faith-based organizations to discriminate against LGBTQ persons. The chart below compares relative search popularity of equal pay and LGBTQ with two other social issues: diversity and minimum wage. As we can see, these search terms have considerably more interest than equal pay and LGBTQ. The potential upside for Benioff and Salesforce is that embracing them could have even higher relevance and impact. The downside is that pushback could be far greater than the prior equal pay and LGBTQ efforts. The best tentative conclusion from the data available on corporate activism is that it more often has a positive impact on company performance. Our testing hypothesis is that consistent CEO and corporate activism can make a brand more human, which in turn increases its short-term attractiveness and long-term goodwill. Further research is needed to validate this hypothesis and determine what types of activist strategies work, and what tends to limit their success. What are the underlying social dynamics surrounding diversity? What are the overlaps between the popular interest in diversity and our company’s mission and values? What are the likely sources of opposition if we become more engaged in diversity? 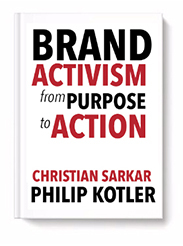 Analytics that shed light on such questions will lead to better informed decision-making about the potential role of activism in branding strategy. For a detailed Google Trends analysis of diversity as a social issue and its potential role in a brand activist strategy, click here. Frank Grillo is the CMO of Harte Hanks. He is a passionate advocate for bringing the human back into marketing by better understanding and facilitating customer journeys. Mark Blessington is a Partner at Consentric Marketing. He has three decades of experience in marketing and sales consulting to many of the world’s largest corporations, and is the author of over 40 articles and four books.